Be demanding – we are too! Orthodontics with the use of transparent aligners are greatly welcomed by orthodontists alike in Munich and also by patients. This is not an unsubstantiated claim! With Invisalign as an orthodontic treatment you can enjoy life just as much. The brace is practically invisible amongst your fellow peers. It gives you the freedom and flexibility to take them out as you please. Particularly during meals and whilst brushing teeth is deemed a great benefit with Invisalign users. Especially for working professionals, the treatment method provides an ideal alternative to other standard orthodontic methods. How does the treatment work with Invisalign in Munich-Unterföhring? To start off with detailed impression of your teeth will be taken. Following this step the orthodontist sets out the treatment schedule on a computer. Step by step the path toward that perfect smile is being simulated in 3D. After that your custom made aligners will be produced just for your individual situation. After insertion of the first aligner, our orthodontic practice will monitor and control progress during scheduled appointments. 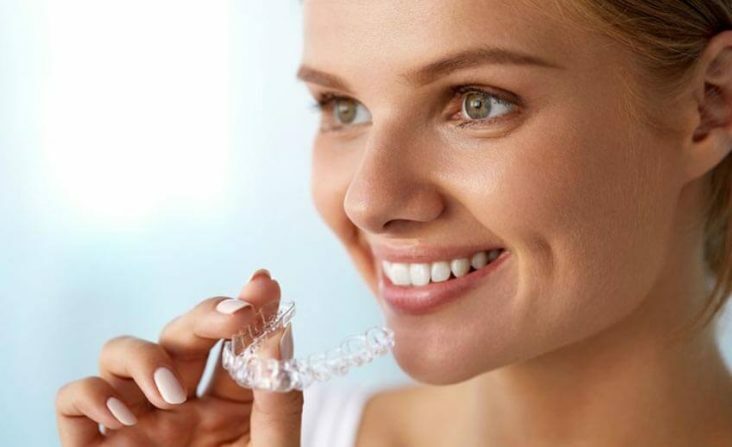 You will receive new transparent aligners along the way, through which the step by step orthodontic treatment will lead you to that dream smile. The duration of treatment is dependent on the extent of the malalignment. If a minimal correction is required, it is possible to reach the desired goal a few months. In cases of extensive correction, orthodontic treatment can take up to approximately 24 months or more. Would you like to know how long treatment would take for you? We would gladly discuss this with you personally! Just arrange an individual and non-binding appointment. We are happy to meet you! Who is suited for an Invisalign treatment in Munich-Unterföhring? Whoever places value on aesthetics and the freedom to remove the braces during your orthodontic treatment should look no further, Invisalign is the answer. For both, adults and adolescents Invisalign proves to be an effective solution to straighten teeth. We recommend this treatment for patients with a light or moderate severity. In more distinct cases we do recommended the also invisible lingual braces (lingual technique). The aligners during an Invisalign treatment are removable. This improves comfort level specifically during meal times and brushing of the teeth. The braces are custom made. Therapy is planned in detail and customised to suit your dental profile. • The aligners are transparent and compared to conventional braces they are practically invisible.